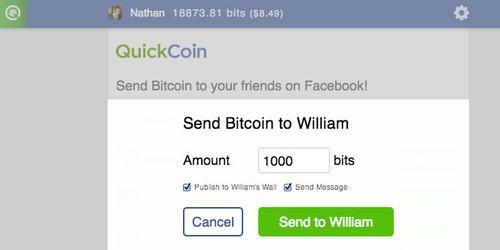 QuickCoin's bitcoin app for Facebook lets users send the cryptocurrency around for free. If you're intrigued by Bitcoin but daunted by how transactions work, there's an app for that -- and it's on Facebook. QuickCoin lets users move the cryptocurrency around for free through the social network. It's a simple process of logging into an account, choosing a Facebook friend and sending bitcoin. The accounts, called "social wallets," display bitcoin in U.S. dollars and in "bits," which are defined as 0.000001 bitcoin. That means US$5 would show up as roughly 8,548 bits instead of a fraction of one bitcoin. One bitcoin was worth about $583 on Tuesday, according to CoinDesk's Bitcoin tracking index. "You don't need to know how DNS works to surf the internet, so why should you have to know how Bitcoin works to use Bitcoin?" QuickCoin cofounder Marshall Hayner said in an online chat. "The answer is clear: you shouldn't have to. We realized if we could make something that makes sense for everyone to use, we could reach a large audience with an amazing world-changing technology, and that's what we seek to do." The app is using Facebook's API (application programming interface) and does not require the social media company's approval, according to Hayner. It's has been running for about a week and Facebook has not contacted the company so far. QuickCoin is a self-funded San Francisco-based startup that's being advised by Jackson Palmer, the creator of cryptocurrency Dogecoin. As far as the company knows, it is compliant with regulations under the U.S. Department of the Treasury's Financial Crimes Enforcement Network (FinCEN), CEO and cofounder Nathan Lands said. FinCEN issued guidelines about virtual currency firms last year.